I've used HMF Powder by Seroyal for the past two years and have had great success with it. Quality is good and the taste is pleasant. After a few weeks of using HMF Powder my 3 year old daughter showed dramatic improvement. She had never had a cold clear up without the help of antibiotics. Now she seems to be able to fight viruses much easier. Have been using HMF Powder by Seroyal in a daily Ultrainflamx shake to help treat inflammation and hyperthyroidism. So far used 6 months and find that this totally balances my gut and helps digestion. I feel much better when I take this supplement. Consistency is an essential part of any nutritional regimen. 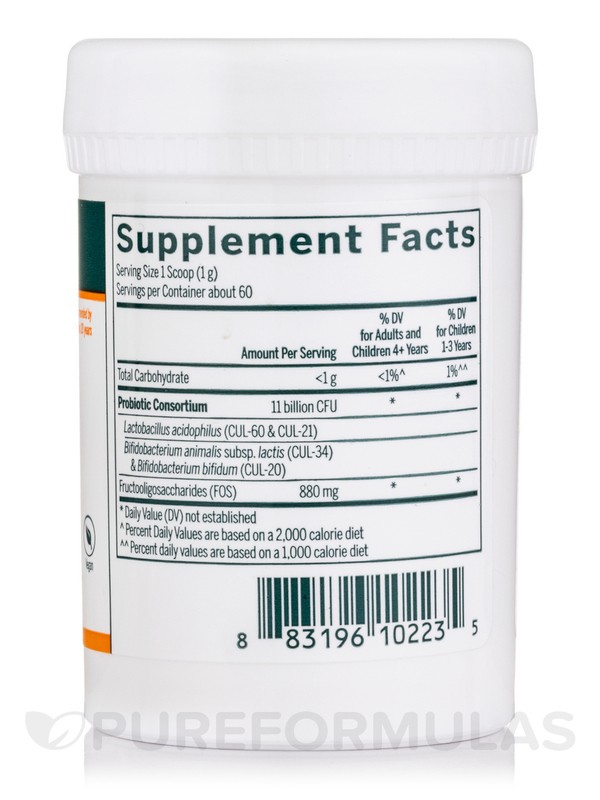 A convenient supplement‚ such as HMF Powder‚ lets you simplify your routine by mixing one scoop with water. 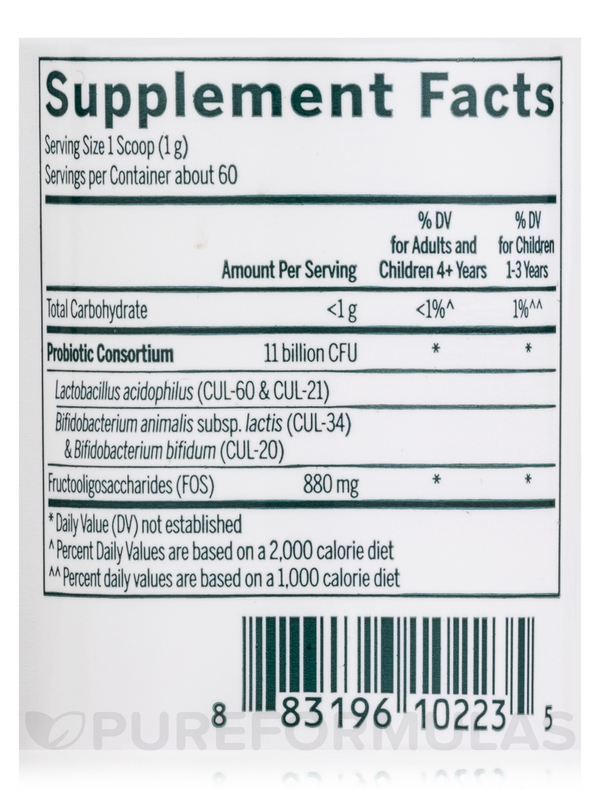 HMF Powder provides two strains of lactobacillus acidophilus: bifidobacterium bifidum and bifidobacterium lactis. They are assisted by fructo-oligosaccharides in fighting the unhealthy bacteria that allow pathogens to enter your body and compromise your immune system. In addition‚ this combination promotes a healthy balance of bacteria in your digestive system. 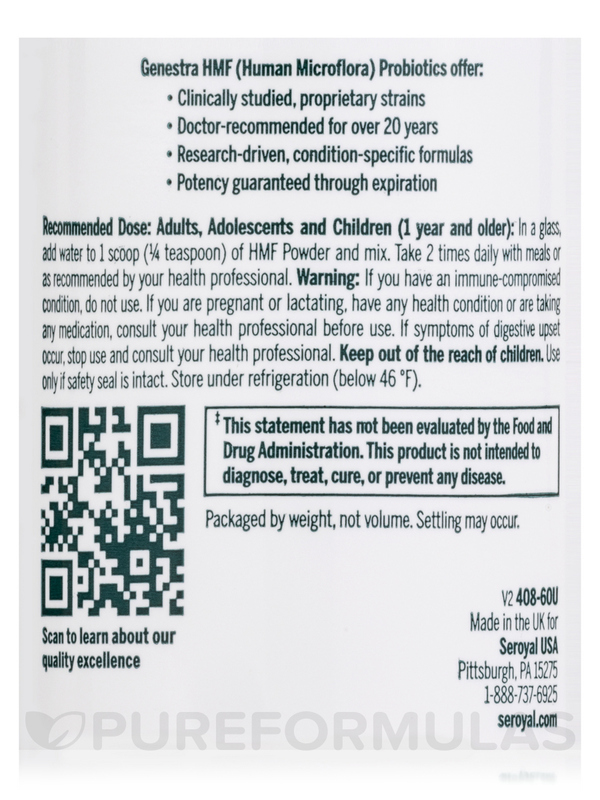 HMF Powder is a high-level maintenance formula especially suited to you if you take oral contraceptives‚ antibiotics‚ steroids‚ or other hormones that interact with normal probiotic supplements. It’s also recommended if your immune system has been compromised due to any diseases. HMF Powder is also an ideal supplement for vegans‚ because Seroyal has made sure that 100% of the material that goes into making this product is sourced from vegetables. 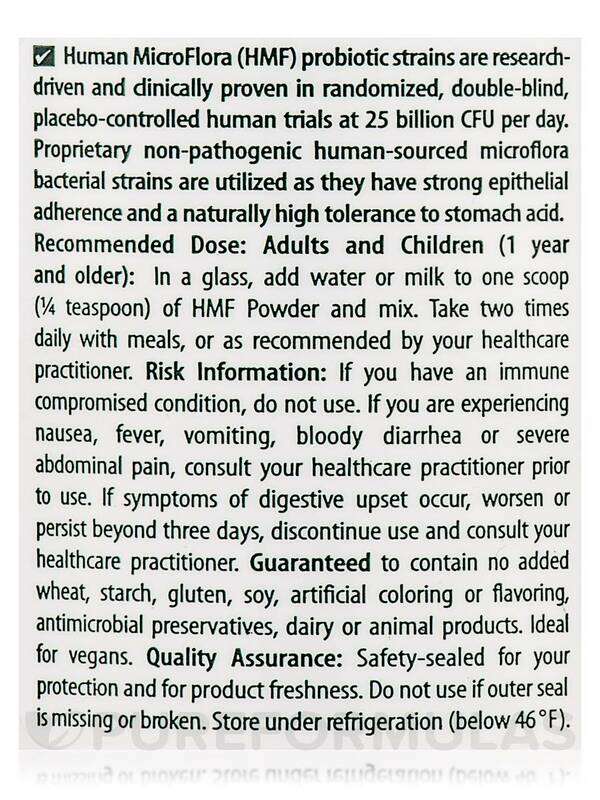 Probiotic supplements‚ such as HMF Powder‚ last for up to six months without refrigeration and are travel-safe. However‚ if you want to keep them fresh for longer periods of time‚ keeping them in the refrigerator or freezer is advised. Adults: 1/4 to 1/2 teaspoon‚ two times daily with meals.Candidiasis: 1/2 teaspoon two to three times daily with meals.Children under 12: 1/2 teaspoon two times daily with meals.Candidiasis: 1/4 to 1/2 teaspoon‚ three times daily with meals. I lived out of the country for 6 months this year and didnt take this supplement with me because I couldnt keep it refrigerated. I ended up with gastritis after ~3 months off of it (something I have had previously). A doctor asked if I was taking a probiotic (which I was but not this one.) Within a month of getting back to the U.S. and back on this probiotic the gastritis is gone. Though it may not the sole reason Im confident HMF Powder is a large part of the reason Im feeling better. I have been giving HMF Powder to my children since they were little. 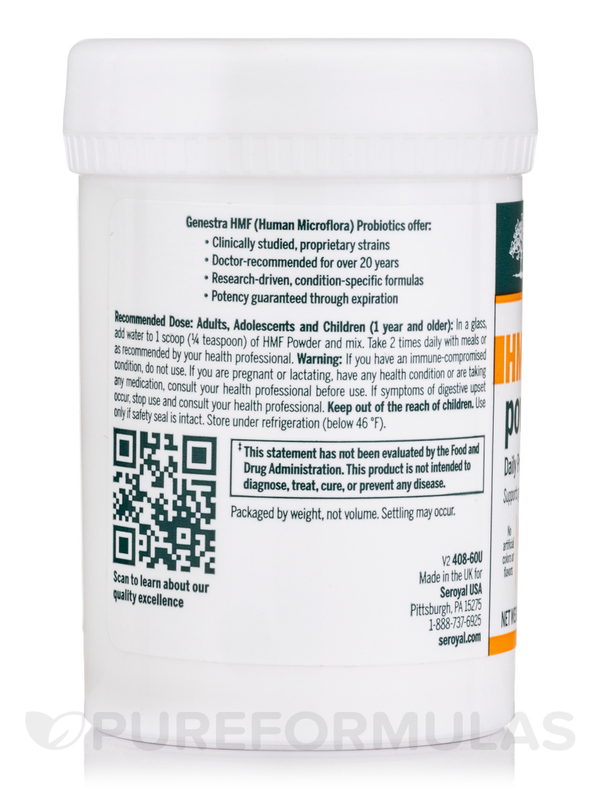 My daughter suffers from constipation but when I give her HMF Powder she has BM every day. During the winter months my children barely get sick and I think the reason for that is that they take HMF Powder daily. I just switched to HMF Powder after taking HMF intensive for several years. I was advised by my holistic doctor to change it up. Its also probably better since its not in a capsule and therefore your body does not have to digest the capsule. Its been a few days and I notice that my digestion is good and the taste is not bad! 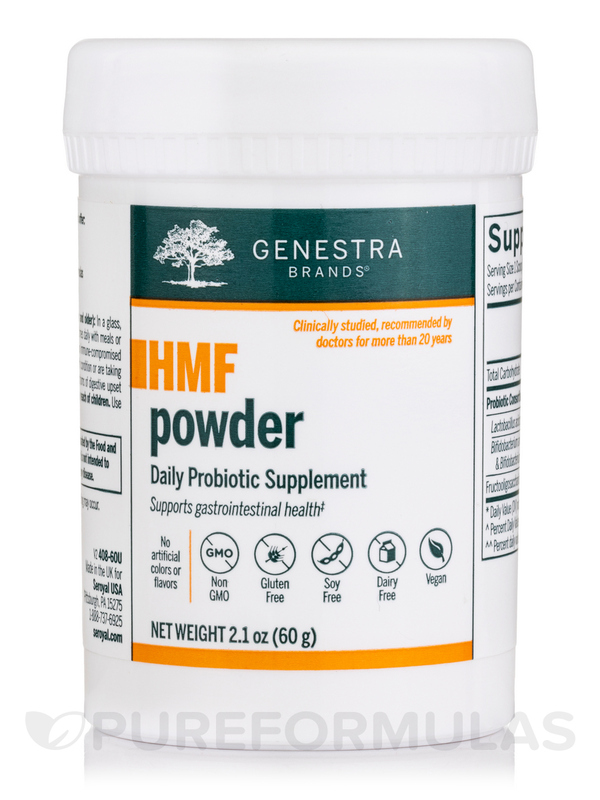 I have never experienced constipation but with this HMF powder I experienced what it is to be constipated. even though i get gas all the time but i always got to the bathroom every day smoothly but with this powder is not possible. my Naturapathic recommended it for me. I actually tried couple times I now know that it is the HMF powder that gives me a horrifying constipation. HMF Powder Cured My Dog! Its Fantastic! My dog has had problems with worms and yeast since we got her from a kill shelter 3 months ago. We didnt know at the time that she had this problem until I gave a sample of her hair and saliva to my holistic doctor to check since everything we were doing wasnt helping. We found that she had a yeast infection due to allergies to modified starches and tapeworm (TaenisPisiformis). I kid you not that is the name. She is 18 pounds and he put her on 1/2 teaspoon of HMF powder by Seroyal and Pleo Fort (have to buy on another site) and she has been so much more comfortable and the tapeworms are leaving. We saw dead ones in her stool. HMF Powder is fantastic Im going to start using it. I feel great hopefully that means that HMF Powder by Seroyal is keeping my system in balance.